One way MU can make some money as it struggles with declining enrollment and lagging state support is to rent out empty residence halls to football fans, eclipse watchers and others who come to town to visit. That's an idea that Gary Ward, MU vice chancellor for operations, shared with the UM System Board of Curators during Day One of its two-day meeting on Thursday. Curators also received a glum report on the state of MU buildings, heard about plans to shore up enrollment at the flagship campus and approved a $3.1 billion system budget for fiscal 2018. They voted to ask the state for nearly $500 million in fiscal 2019 but postponed a vote on how much money they should ask the state to give the four-campus system next year. McDavid Hall will house the Engineering 2 + 2 program. Respect Hall will house Human Environmental Science Extension. Discovery, Excellence and Center Halls will be used for conference/guest housing. Responsibility Hall will be leased to MU Health Care. Schurz Hall will be converted into a campus education and general use building. Ward also told the curators that Residential Life will offer residence halls for guest housing during the Aug. 21 total solar eclipse, during Family Weekend Sept. 15-17 and during MU home football game weekends, as well as use them to house visiting students and athletes in them. Residential Life at MU already has created a website where people can reserve residence hall rooms. "Stay close to the action in sweet, suite style for home football game weekends this fall," it says. The website advertises two-bedroom four-bed suites for $120 night and notes that they're within walking distance of Memorial Stadium. There's plenty of room at the inn. Excellence, Center and Responsibility halls have a total of 518 rooms. Residential Life this year decided to temporarily close those halls, as well as Respect, Schurz and McDavid halls in the coming academic year, and it has already shuttered Laws and Lathrop halls and plans to demolish them, according to previous Missourian reporting. Not only are the rooms unnecessary given declining enrollment, but MU has said closing them would save money on utilities. It remains to be seen whether the rooms will prove popular enough to visitors to offset the cost of keeping the buildings open. Ward also painted a dire picture of the condition of other buildings. MU's educational and general purpose buildings are in serious disrepair, he said. Nearly a third of MU's educational buildings score more than 0.40 on the Facility Condition Needs Index, which compares the cost of replacing a building to the cost of renovating it. Scoring 0.40 or above is terrible, Ward said. Ward suggested that MU examine how efficiently it uses campus space and that it demolish buildings that score high on the index. "When you have a budget crisis, it's no longer a great idea but a requirement," Ward said. The board also discussed how to boost the number of students living on campus, including the possibility of no longer requiring those students to buy meal plans. Curator Darryl Chatman asked whether MU had considered requiring sophomores to live on campus, but Ward said incoming freshmen might consider that a detriment. Besides, they would not have the room, even with the repurposed residence halls. Next year, MU will present recommendations for buildings to be demolished to the board. Pelema Morrice, vice provost for enrollment management, updated the board on MU's efforts to combat declining enrollment. MU, he said, has never actually had a specific enrollment strategy to ensure growth. Rather, growth shaped its strategy. Enrollment dropped for students of color across all spectrums as well as in MU's primary feeder markets: St. Louis, Kansas City and Columbia. With MU still being a primarily white institution, caucasian enrollment was its greatest loss. Net tuition revenue per incoming student (which factors in financial aid and scholarships) is projected to be $5,054, a minor increase over last year's $4,996. The projected first-year class is 4,009, down 763 from last year's 4,772. Morrice said MU would increase its recruiting in non-feeder areas such as California, Nashville and Houston, as well as ramp up its efforts in rural areas. Next week, the Office of Admissions will announce new incentive packages for Missouri National Merit Scholars. MU is also developing a scholarship that will be offered to students who are eligible for Pell Grants who will pay full cost of tuition and fees. MU will introduce a common application in August to draw in more applicants and, over the next three years, adjust its application deadlines. Common applications allow prospective students to apply to several colleges and universities by filling out a single form. Ryan Rapp, chief financial officer for the UM System, presented a $3.1 billion budget for fiscal 2018, which begins July 1. Of that, 36 percent is for operations, including employee salaries, wages and benefits of $1.2 billion. System-wide, $584.8 million in revenue will come from tuition and fees and $415.2 million from state appropriations. 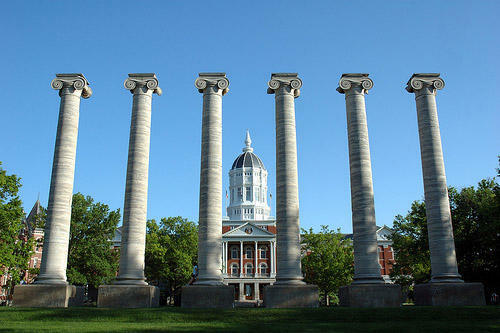 At MU, the total budget is $1.37 billion, which includes $438.6 million in salaries, wages and benefits. Tuition and fees account for $275.2 million in revenue, and state appropriates $209.1 million. MU and the other three campuses recently made cuts totaling about 12 percent of their budgets across the board. At MU, 429 positions were cut, including some that were already vacant and will not be filled. "There's much work we have to do in FY 18 to improve our performance," Rapp said. Because of the dip in state funding, the UM System is moving to rely less on state money and more on revenue generated from tuition and endowments from alumni. "It's probably our most challenging to find, but it's also the most lucrative," Rapp said. All four campuses will continue reviewing programs. Rapp said better processes will be put in place for eliminating them, keeping in mind the students who are in the midst of earning degrees. UM System President Mun Choi noted that there was a lot of alumni outrage when MU announced the sudden elimination of the agriculture journalism program. "You saw all of the concerns that were raised by alums," Choi said. Curators also approved a request for state appropriations of $471 million for fiscal 2019. That includes $456.1 million in core funding and another $14.9 million for other programs and legislative requirements. The curators, however, found themselves at a standstill regarding how much money to ask for from the state for major building projects. Rapp presented several proposals from individual campuses, but curators wondered why they should bother asking for any money, given the slim chance the legislature would give them any. For MU, Rapp proposed asking for $150 million to finance redevelopment projects and to help pay for the Translational Precision Medicine Complex planned for land at Hospital Drive and College Avenue. Curator Phillip Snowden suggested a more reasonable request might be $40 million. Choi and two of the board's newest curators, Chatman and Jeff Layman, questioned why they were even discussing requests for state money that they know they won't get. Rapp said the UM System does so every year. Choi emphasized the projects' importance for maintaining MU's ranking with the American Association of Universities and said the board should explore how to raise money from alumni and potential investors and how to shift money within the budget to finance the projects. He also suggested research partnerships with federal agencies such as the Departments of Defense and Veterans Affairs as another source of income. "We have to find, one way or the other, a way to make these projects happen," Choi said. The board eventually decided to table discussion of that request and to appoint a committee to create a policy for how curators should prioritize capital projects.